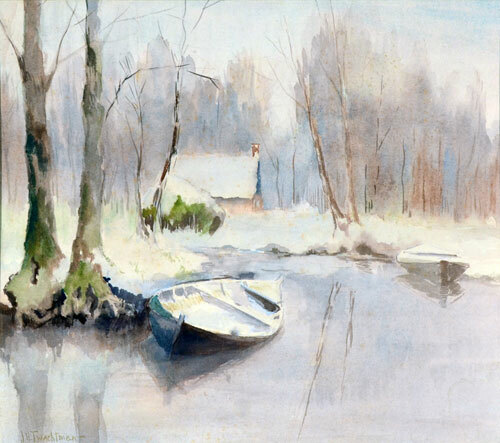 John Twachtman was born in Cincinnati of German émigré parents. He enrolled at the Ohio Mechanics Institute at age 15 but transferred to the McMicken School of Design in 1871. His classmates at the time included Kenyon Cox, Joseph DeCamp, and Lewis Meakin. In 1874, Twachtman began study with fellow Cincinnatian Frank Duveneck and, in 1874, went with Duveneck to Munich, where he enrolled in the Royal Academy. In 1877 he accompanied Duveneck and William Merritt Chase to Venice. The artist returned to the U.S. in 1878, settling eventually in New York City and participating in the first exhibition of the Society of American Artists. He also formed a lasting friendship with Julian Alden Weir during this time. Twachtman returned to Cincinnati briefly in 1879 but soon journeyed again to Europe, where he spent a great deal of his time in Holland and acquainted himself with Anton Mauve and the artists of the Hague School. In 1883, he went to Paris to study with Jules Lefebvre and Louis Boulanger at the Académie Julian. During his stay in Paris, his somber, gestural Munich manner gave way to a lighter, more monochromatic palette and a smooth paint facture, as the artist fell under the influence of James McNeill Whistler. His associates in Paris included Childe Hassam, Edmund Tarbell, and Willard Metcalf. In 1890 Twachtman purchased a small farm in Connecticut containing a stream, called Horseneck Brook. The brook and its surroundings, including a small pool near his house, became favorite subjects of the painter. Painting these scenes at all the various times of year, Twachtman sought to capture the mystery and subtle poetry of nature in its many moods. In 1897, the artist became a founding member of the Ten American Painters, who had seceded from the Society of American Artists. He died in Gloucester, Massachusetts, where he had spent several summers, in 1902. Like his close friend J. Alden Weir, Twachtman became adept in both the soft, closely related hues of the Tonalist style and the more vibrant color and broken brushwork of the Impressionists. He is regarded today as an exemplar of both manners in America. Twachtman’s work can be found in most major American museums, including the Cincinnati Art Museum, the National Gallery of Art, the Museum of Fine Arts, Boston, the Brooklyn Museum, the Corcoran Gallery of Art, the Detroit Institute of Art, the Phillips Collection, and the Los Angeles County Museum of Art.